One way of gaining experience in assessing is through shadowing other assessors. If you’re not familiar with this term, shadowing an assessor basically involves observing another assessor within your industry carrying out real-time assessments on a learner. If you were shadowing, you wouldn’t be required to say or do anything, just watch and take notes. Obviously, it is going to be unpaid experience, but it’s all good experience nonetheless. Now, if you don’t have a Linkedin account, then this tip isn’t much use to you at the moment. That is why you should go and create a Linkedin account right now! For those of you that don’t know, LinkedIn is a social networking platform; specifically designed for the business community. Basically, it’s like Facebook for businesses and business people. The main purpose of LinkedIn is for companies and members to build working relationships and networks. Anyway, that’s enough on what it’s all about, more on how LinkedIn can be incredibly useful for you as a newly-qualified assessor. Your profile is basically a virtual CV. So, even if it takes you a good few hours, you need to optimise your profile to appeal to the right people. These days, it’s not uncommon for companies to use social media when they are looking at filling job vacancies. Whether it be just to research candidates that have applied for a job, or even for crawling LinkedIn and headhunting prospective employees based on their skills and experience. That is why you are going to want to big up ALL of your strengths and especially those that are particularly important for an assessor. It is okay to be a LinkedIn groupie – In fact, it’s more than okay, we would strongly recommend it! Join as many relevant groups as you can; that includes groups that are both relevant to your industry and to your role as an assessor. Every group has two sections, one for discussions and one for jobs. If you really want to ensure that you have access to every possible job opportunity, then it’s down to you to make sure that you are in all of the right places. Who knows, you may find assessor jobs within these groups that aren’t showing elsewhere online. In addition to this, the ‘discussions’ section within these groups is an ideal place to ask about opportunities, voluntary or paid. You don’t follow or befriend people on LinkedIn, you ‘Connect’. So this piece of advice is a simple one, but also possibly the most effective when it comes to taking advantage of LinkedIn. The more connections you have, the more potential for opportunities to arise. It is as simple as that. So, connect with family, friends, colleagues, people within groups… just connect away! Here at Brooks and Kirk, we have had past learners who have been headhunted on LinkedIn whilst completing the assessor course. They’ve gone on to connect with important people and get the assessor job they were hoping for. All just for having a LinkedIn profile and connecting with people. This new assessing role can be an ideal way to gain experience in vocational assessment. But before we go into the ‘How’ and ‘Why’, we should probably cover the ‘Whats’. What is an End-Point Assessor and what do they do? An End-Point Assessor is an independent assessor who is responsible for determining what type of grade an apprentice achieves upon completion of their apprenticeship (Pass, Merit or Distinction). Only once a learner has completed all of the qualifications that make up their apprenticeship, do they go on to the synoptic assessment with the End-Point Assessor. This is a one-off assessment that will likely comprise of 3 or 4 different types of assessment. Just to clarify, the End-Point Assessor isn’t involved in the assessment of the apprentice’s NVQ in any way, shape or form. It will be the college or independent training provider that will be responsible for that. Okay, so how and why? For those of you that are short on experience in assessment, providing you are eligible to work as an End-Point Assessor, there is no better way to pick up the experience you need! Generally speaking, it isn’t as crucial to have extensive experience in assessment for EPA jobs as it is for NVQ Assessor jobs. If you have a read through the blog post we did on End-Point Assessments, you will see that the requirements for End-Point Assessors do vary from apprenticeship to apprenticeship. So, whilst we can’t say that this is the case for all apprenticeships, MOST End-Point Assessments don’t require an experienced assessor to carry them out. There tends to be a lot more focus on the amount of years experience you have within your industry as opposed to experience in assessing. There is a lot to take in and understand when it comes to End-Point Assessments, so if you would like to find out more, we would recommend having a more in-depth read about The New Assessing Role here. When looking for assessor jobs, we recommend looking on both Job and Recruitment sites. There are specialist job and recruitment sites for the Further Education sector which quite a few people aren’t even aware of. To make it as easy as possible for you to find your perfect assessor job, we have included a list of recommended recruitment agencies and job sites below. You will see that some of these sites are FE specialists and the others just have too many assessor jobs to leave off the list. Furthermore, we have close relationships with the majority of specialist companies that are listed below, so we are confident that you would be in safe hands. We appreciate that the FE sector is a nightmare for acronyms! So, just to clarify, when we say ‘AET’, we are referring to the Level 3 Award in Education and Training. This qualification replaced a qualification that was commonly known as the ‘PTLLS’ Award. The Level 3 AET is essentially the first stepping stone towards becoming a qualified teacher in adult education. For example, the AET on its own is enough to get your foot in the door at a Further Education college; so it’s certainly not to be sniffed at! If you have been having a look online for assessor jobs, you may well have seen that quite a few say having a ‘PTLLS or AET’ qualification is also ideal. And that is because it compliments the role of an assessor so well! Think of it like this, your main role as an NVQ assessor is to assess a learner’s vocational knowledge and skills. What happens when you identify gaps in your learner’s knowledge and skills? Well, you should be able to teach them what they need to know to fill those gaps. This is where the AET is ideal because it provides you with the skills you need to be competent in the teaching aspect of your role as an assessor. Plus, you get an accredited qualification to evidence that competence as well. The requirement for an assessor to be able to teach where necessary is becoming increasingly important as well. Especially for anyone that is involved with the assessment of qualifications as part of the new apprenticeship standards. Please click on the following link if you would like to find out more about our AET Course. So, now you’re scanning through assessor job adverts and one catches your eye… The only problem is, it says you need ‘2 years minimum experience in assessing’ and you don’t have that. Don’t let this put you off, apply regardless! That’s you all tipped up! 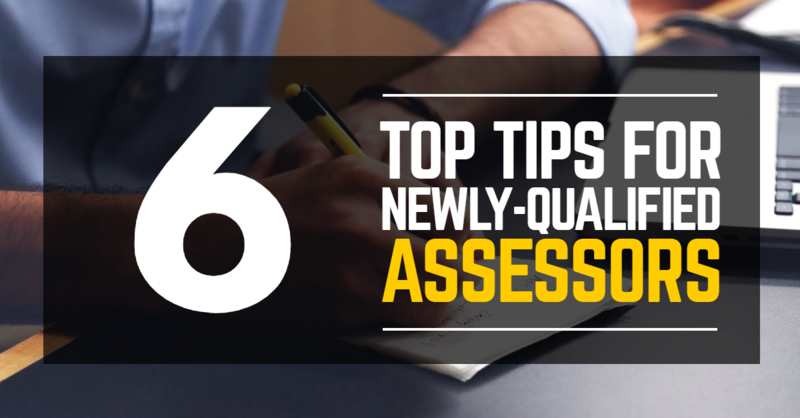 And that brings us to the end of our 6 top tips for newly-qualified assessors. We hope that you have been able to take at least one action point away from this blog. All things being well, this time next month you’ll be wanting 6 top tips for settling into a new assessor job! Thanks for the information provided. Very useful. This article was really useful. Thank you for the information. This is a really useful website I have book marked you. This article has answered my main concerns on how to promote yourself as an assessor. I particularly liked your tips on shadowing and not being over cautious about applying for jobs with 2 years plus experience.